Very obese women should actually lose weight during pregnancy in order to have a healthy baby, contrary to current recommendations, according to a new study in the journal Heliyon. The researchers behind the study, from Centre Hospitalier Universitaire Sud Réunion in France, say the current guidelines for weight gain in pregnancy should be adjusted for better outcomes in underweight and very obese women and their babies. The new study reveals the optimal weight gain for women that would give them a balanced risk of having a very small or very large baby. The findings will enable healthcare providers to give their patients more personalized recommendations. The team has developed an online calculator that can advise women on their ideal weight gain for the safest birth outcome, based on the research. "The results of our research provide a solution to the conundrum affecting the 135 million pregnancies per year on this planet," said lead author Dr. Pierre-Yves Robillard. "Women want to know what their optimal weight gain should be to have their baby as safely as possible, and their maternity care providers want to know what advice they can give women throughout their pregnancy. While our results show the recommendations are fine for women in the normal weight range, we have shown they are not ideal for very underweight and very overweight women." There is a strong link between the weight of mother and baby: very underweight mothers tend to have smaller babies – called small for gestational age (SGA) babies – and morbidly obese mothers tend to have more large for gestational age (LGA) babies. These babies are at higher risk of conditions like heart attacks, hypertension, obesity and diabetes as adults than babies born at normal weight. In order to ensure babies have the safest births and healthiest lives possible, there are guidelines recommending the ideal weight gain during pregnancy based on body mass index (BMI). These guidelines, set by the US Institute of Medicine in 2009, have been subject to some controversy: in countries where women are generally smaller, such as Japan and Korea, healthcare providers have suggested the weight gain at the lower end of the spectrum is not sufficient. With the increasing burden of obesity in many countries, it has been suggested that very obese women should in fact lose weight during pregnancy. To test these claims, Dr. Robillard and the team carried out a 16.5-year observational study. They recorded the pre-pregnancy BMI, weight gain, and weight of the baby of 52,092 women who gave birth at full term. 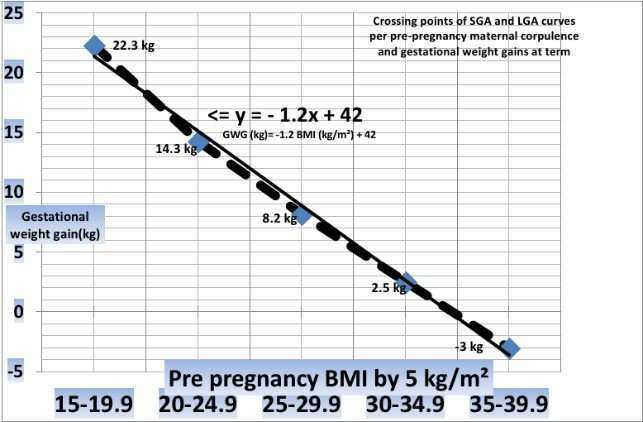 The first finding was that only women with a normal BMI had a balanced risk of having an SGA or LGA baby (both 10 percent risk); they call this crossing point the Maternal Fetal Corpulence Symbiosis (MFCS). 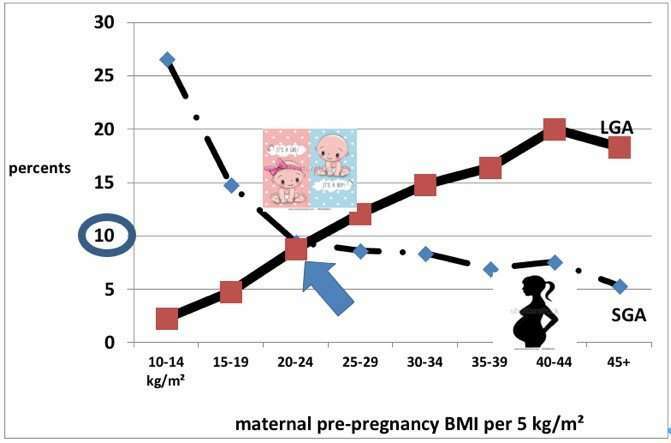 They then looked at how this MFCS shifted with BMI and weight gained during pregnancy. They pinpointed for each BMI category what the optimal weight gain should be for a balanced risk of having an SGA and LGA baby. This revealed that although the current recommendations are correct for women with a normal BMI, they are not correct for underweight or obese women. According to the study, a woman with a BMI of 17 should gain about 22kg instead of the recommended 12.5-18kg. An obese woman with a BMI of 32 should gain 3.6 kg instead of the recommended 5-9kg. And a very obese women with a BMI of 40 should actually lose 6kg. "We were surprised to find such a linear connection between BMI, weight gain and MFCS," said Dr. Robillard. "The results will greatly facilitate an individualized approach when advising women about their optimal weight gain during pregnancy without having to put them into fixed categories – using the equation we uncovered, it's possible to give specific advice based on the exact BMI of the woman." The results have already led to an online calculator in which a woman can enter their height and weight to get a specific recommendation for her optimal weight gain, based on the research results. This could be developed into an app for women and their healthcare providers.